Not to be confused with Michael Callen. Michael Callan (born November 22, 1935) is an American actor. Born Martin Harris Calinieff in Philadelphia, Pennsylvania, he began his career as "Mickey Calin", and it was with this name that he appeared on Broadway in The Boy Friend (1954), Catch a Star (1955), and West Side Story (1957–59), in which he created the role of Riff, leader of the Jets. His film career began in 1959 where he was contracted with Columbia Pictures and had roles in two films, They Came to Cordura and The Flying Fontaines. Although he was unable to reprise his West Side Story role of Riff in the film version due to his contract with Columbia, he did dance in the film Gidget Goes Hawaiian. His screen credits include The Interns, Mysterious Island, The Victors, Cat Ballou, The Magnificent Seven Ride, Lepke and The Cat and the Canary. In August 1965 he signed a four-picture deal with Columbia and was mentioned as a possible star for Marooned, then being directed by Frank Capra. In 1966 Callan landed the lead role of Peter Christopher in the NBC Television sitcom Occasional Wife. At the time Callan was married to the former Carlyn Chapman. The young couple lived in Beverly Hills and had two daughters. He engaged in a 12-hour day filming schedule with weekends off for the production of the half-hour television series. Callan divorced Carlyn and was married for a time to Patricia Harty, the actress who played his "occasional wife" in the series. 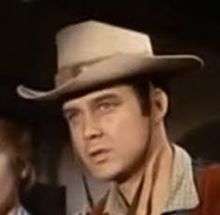 His additional television credits include Breaking Point, Hazel, That Girl, The Name of the Game, The Mary Tyler Moore Show, Ironside, Marcus Welby, M.D., Griff, McMillan & Wife, Barnaby Jones, 12 O'Clock High, Quincy, M.E., Charlie's Angels, Simon & Simon, Fantasy Island, The Love Boat, The Bionic Woman, four episodes of Murder, She Wrote and eight episodes of Love, American Style. He played Metallo in Superboy. Callan both produced and starred in his own film, Double Exposure (1983), He also returned, occasionally, to the stage in both legit plays and musicals including Absurd Person Singular and The Music Man. Callan appeared in the Off-Broadway musical Bar Mitzvah Boy in 1987. His recent movie credits include Stuck on You (2003) and The Still Life (2006). ↑ Michael Callan profile, filmreference.com; accessed April 4, 2015. Wikimedia Commons has media related to Michael Callan.